The inclusion of a gender perspective with an 'added value' has been gaining strength in the proposed 'low-carbon growth', highlighting the female lead potential to 'accelerate green growth' and to respond to climate change. From growing evidence that women are at the heart of the challenge of climate change, and are disproportionately affected by its impacts, such as droughts, floods, extreme events etc., they also have a critical role to play in combating the weather changes. In this process, in September 2013, more than 100 women's rights leaders and activists from 35 countries gathered in New York to create an international movement to increase the attention, funding and action on the issue of climate change and to launch a Women's Climate Action Program presented to the United Nations during the first International Women's Conference on Land and Climate (IWECS), a branch of the International Women's Earth and Climate (IWECI). Under the UNFCCC process (Framework Convention of the United Nations on Climate Change) has been gaining momentum the demand for climate policies 'gender-sensitive', as well as training to promote greater participation of women in the negotiations. The COP 19, held in Warsaw in 2013 for the first time had a day dedicated exclusively to gender issues (gender day). One of the activities was the launch of a portfolio of demonstration projects under the initiative ‘Momentum Vision for change: Women to get results’. These include adaptation or mitigation activities (such as 'clean energy for household lighting or kitchen') and its criteria demonstrate the leadership and active participation of women. They may eventually ask that it is registered under the flexible mechanisms of the Kyoto Protocol: Clean Development Mechanism (CDM) or Joint Implementation (JI). In the report of the UNFCCC 'CDM and Women (2012), the CDM is presented as having the "potential to contribute to the empowerment of women' which is proven through several of its methodologies. 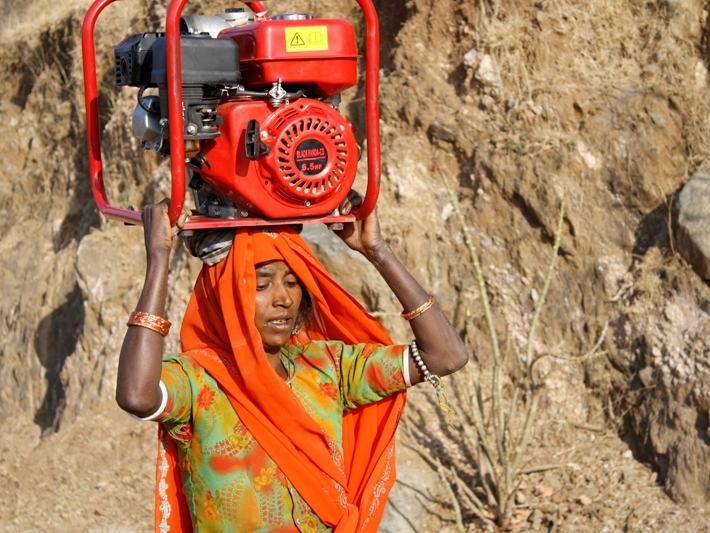 The idea of an additional market value assigned to the 'gender' differential is beginning to be a reality in some projects directly connected to the process, especially in the implementation of climate policies; it has stretched the boundaries of financialization, such as those dealing with the preservation of assets called Natural Capital, such as carbon. To ensure that women benefit effectively from the mechanism of reducing emissions from deflorestation and forest degradation (REDD +), the initiative Women in REDD + led by IUCN Intermedia investors which want to pay a 'plus' to the carbon sequestered or avoided in projects that ARE run exclusively by women. One reason is the assumption that women, especially heads of households, are more responsible in regard to the maintenance of the contracts, which are usually long-term and of careful preservation of the asset (in this case, carbon) since this income would be linked to a long-term project for the sustenance of the household and the children. A step in this direction was the launch in April 2013 of the Women's Carbon Standard (WCS) as an important tool to add new 'layers' of benefits to carbon credits. The same project, or the commodity supply chain (supply chain) could 'stack' multiple layers of new assets: carbon credits, FSC certification, Fair Trade certification label and W + benefits. Due to the low price of carbon on the market today, the WCS was reformulated and launched in November 2013, at COP 19. Renamed as W + this indicator aims to measure in six concrete categories, benefits that mitigation projects might have on women. They are procedures and architectures to monetize the benefits produced by women, adding value to the projects and aiming to attract 'investors'. This kind of benefit was initially conceived as an additional (co-benefit) to the carbon value, but it advances to be an independent 'asset' (stand alone) and treated as a commodity. WILL THERE BE IN THE NEAR FUTURE DEMAND AND A MARKED FOR GENDER, AS THERE ALREADY IS FOR CARBON, AND IN A STEADY GROW FOR ENVIRONMENT SERVICES? According to its proponents, yes, there will be. The signatories of the Women's Empowerment Principles: Equality Means Business with the Global Compact took gender mainstreaming goals in their corporate social responsibility programs. Companies such as AVON, Coca Cola, Nestle, GAP and others have plans and goals in this regard. The initiative 5by20 Coca Cola has pledged to 'empower' five million women entrepreneurs by 2020. The company will not necessarily work at the local level, in small projects with women, but will seek 'on the market' to support project portfolios that have this aim, to put it as added value in their corporate social responsibility balance. These projects will be developed by NGOs that have a verification methodology of 'gender impact' and are certified. This way, we would be on the way to the w + and other gender standards so the gender benefits become 'visible' and 'monetized'. The same way as the idea of the natural capital is to make the value of the environmental services 'visible' and 'monetized'. For example, a number of projects, especially in Africa, promote small artisanal cookstoves in order to improve the quality of life, freeing girls and women of hours spent and from the painfulness of collecting firewood, time that could be invested in other things. A trend among carbon investors, clean cookstoves besides generating credits for compensation (offset), also add W + gender factor to the project's differential and are already identified as a methodology to account for the 'co-benefits' of REDD projects, since the wood collected by women for the kitchen, in this view, is part of the 'degradation' of forests activities. According to the proponents of W + initiative, there is a huge potential market with the fulfillment of Sustainable Development Goals, as well as the closing of a 'positive balance' to the Millennium Development Goals, and to redefine the international cooperation agenda for the development, to the extent that it is subsuming to the climate financing schedule and the inevitable gender mainstreaming. Moreover, it is a clear tendency to approach feminist arguments about the care economy with the green economy. From the center of the system there is currently a call for women to join the concentrated effort to save the current economic model and the rationality and worldview that supports it. Today we see the value of incorporating the gender dimension and recognition of attributes and capabilities 'typically female' associated with the image of renovation (and legitimacy) of central institutions of the status quo as IMF (International Monetary Fund), FED, etc. To the expansion of growth (albeit 'green') and even as an added value to the new frontiers of commodification, as in carbon projects that ensure a 'plus' IF associated with women. The process of creating new economic assets that we see today occurs in parallel with a process of privatization, which, to guarantee private property rights over these common goods, need to create the 'enclosure'. This dynamic reiterating a structural movement and necessary for capital accumulation has a differential impact on women. First, because the projects come violently changing the logic and dynamics of the territories, separating women from access to the commons that guarantee their way of life, which directly affects also children and the elderly, who most often are under their care and direct dependency. In the case of rural areas, where there is title to the land, the property is usually the name of the man who has the power of decision and accept the compensation projects (hydropower plants, mining sites, etc.). The resistance to these projects in the territories, on the other hand, has been led by women's groups in various places. In these cases, the financialization of nature also has specific effects on women. As they are the heads of many processes of resistance in the territories, they are affected by the process of fragmentation and cooptation of the same struggles and resistances with the arrival of compensation mechanisms. As agreed at COP 18, Doha, paragraph 10 of Decision 23 / CP.18.